ISLAMABAD, Aug 12 (APP): Pakistan will invite India for an exclusive dialogue on Jammu and Kashmir, despite the stalled Composite Dialogue process between the two countries. 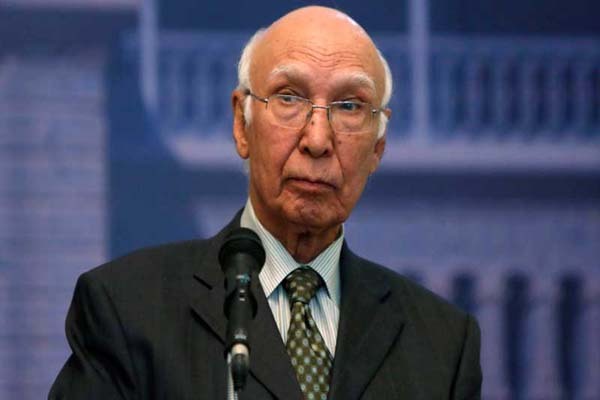 “The foreign secretary will formally write a letter to his counterpart soon to discuss the issue of Jammu and Kashmir,” Sartaj Aziz, Advisor to Prime Minister on Foreign Affairs said here at a press conference on Friday. Sartaj Aziz said Pakistan wanted to discuss the Kashmir issue on priority in view of the ongoing unrest in the Indian-held Kashmir due to indigenous movement of self-determination. He said the recently held Envoys Conference in Islamabad also noted that India’s policy of not engaging in a comprehensive dialogue with Pakistan was not conducive for peace in South Asia. He mentioned that the Conference spent considerable time on the grim situation in the Indian Occupied Kashmir and Indian brutality after July 8. The Conference condemned the atrocities being committed by the Indian forces on unarmed and innocent Kashmiris, he said. Sartaj Aziz said it was decided that Pakistan would continue to extend full diplomatic, political and moral support to the Kashmiris movement for self-determination.